Here's a recent drawing of some French bread. I was just flipping through a book at breakfast that I picked up this week, Alex Toth in Hollywood and this panel really struck me as VERY Toth-ish, nice! That is now my favorite drawing of french bread. Great stuff! I love your ink work. And that hair is awesome! I love the thick inks on this, and the background characters are great. 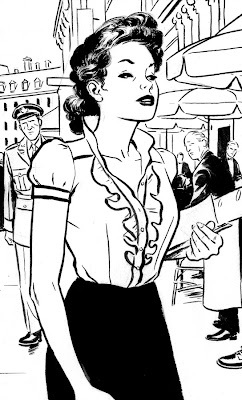 A nice Caniff/Sickles vibe throughout that really plays well. Gah! I've been poring over the work of precisely those 3 artists lately. I'm either nailing it or stealing too much! I also just watched a Toth documentary in which he mentions Caniff and Sickles as among his top influences. Mom! You know there isn't any smoking in Marvel comics.